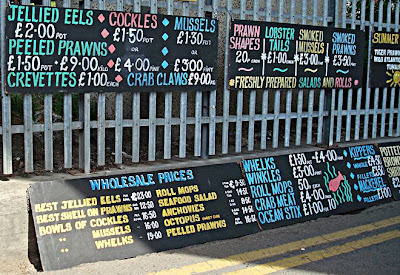 As London swelters, it's nice to imagine being at the seaside, so here are some pictures of Leigh on Sea last year. Eighteenth and nineteenth-century schools offered more than an education to their pupils. They also provided a school uniform: thus these figures on a former charity school in Hatton Garden served as illustrations to help persuade parents to allow their children to attend. (Many families preferred their younger members to be economically productive rather than educated). The sum of Thirty Shillings for a Boy, and Twenty Shillings for a Girl, required as security for the Clothes, is deposited in the Savings' Bank for the Benefit of the Child, and returned with the Interest accumulated, to the Party who holds the Receipt, when the Child leaves the School. The careful differentiation between boys and girls is a theme of the whole document: thus the school took thirty girls but fifty boys. It educated the boys, 'sons of Shipwrights, Carpenters, and Joiners' to be 'bound out Apprentice' while the girls were 'instructed in useful Needle-work and Domestic duties'. Finally, a prize of £5 in money and £1 in books was awarded annually: on two consecutive years to a boy, and only on the third to a girl. High Street, near the Broadway, Deptford. The Lecture will be illustrated by Diagrams on a large scale, drawn on a vertical surface in the presence of the audience, and each problem will be demonstrated practically, so as to render all the principles of construction self evident; - the Lecture being intended to meet the wishes of young Gentlemen and others preparing for CIVIL ENGINEERS, ARCHITECTS, SURVEYORS, and MECHANICS. It is also hoped that Ladies will find the Lecture of considerable service in their studies of GEOGRAPHY, DRAWING, &c.
TICKETS 1s. each, may be had of Mrs. Brown, Printer, opposite the Church; and an early application is recommended as only 60 Tickets will be sold. Doors open 7 o’clock, and the Lecture to commence precisely at ½ -past 7. BROWN, Printer, High Street, Deptford. 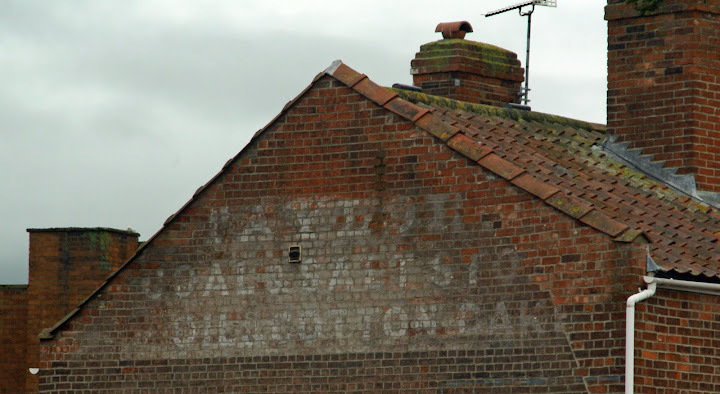 A while back, I posted this ghost sign from Bridgwater, Somerset and the consensus among those who so helpfully commented was that Taylor's probably offered wharfage. I've just bought an old postcard which shows that back when it was fully legible, the second line did indeed read 'coal & salt store'. 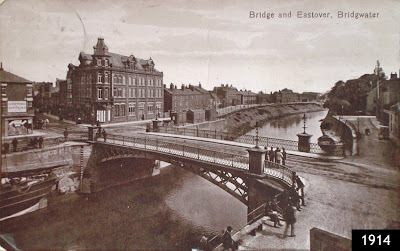 More exciting is the date of the postcard: it is postmarked 1921. Another card which bears a postmark from 1914 is fainter, but appears to show an unpainted wall. It's amazing to think that this bit of faded painting has survived since just after the First World War. 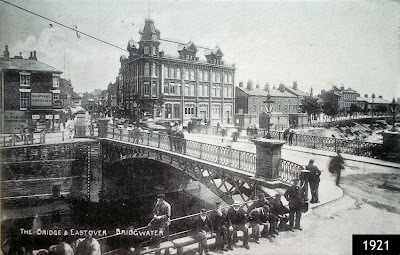 (It's on the gable end of the first row of houses on the far side of the bridge, just next to the rather grand corner building). In both postcards, a shop on the riverfront bears a sign which reads 'shipping supplied'. Having lived in the town long after the River Parrett became too silted-up to support such maritime activity, it's always intriguing to see these traces of its more illustrous past. London's docks were rife with smuggling and stealing - and Deptford was seemingly no exception. Many goods were heavily taxed, meaning that if you could sneak them into the city unofficially you could undercut honest importers' prices. Everyone was happy: the seller made good money, the buyer got a bargain - everyone except the state, of course. Mr Trickett's shop - at one time called the Grasshopper - was in former days the most noted tea-shop in the town and neighbourhood, the tea being smuggled from the East Indiamen in the river, in sacks of sawdust. * Tidesman: a customs officer who went on board ship to secure payment of duties. Like many nineteenth-century towns, Deptford had a Mechanics' Institution. Indeed, the proposal for this institute pre-dates Victoria's reign. In 1825, Olinthus G Gregory held a meeting of local mechanics at which he proposed its establishment to enable 'diffusion of knowledge'. Gregory told his audience that practitioners were more likely to make advances in science than those dedicated to theory; he backed up his claim with examples including Richard Arkwright, inventor of the spinning frame, and James Watt of steam engine fame. These men may have been 'low born', argued Gregory, but they had the advantage of being Englishmen,* 'the most free, the most intelligent, the most inquisitive, the most virtuous people on the face of the earth'. Gregory himself was an example of someone who had achieved a great deal although his parents were sufficiently humble that their identity is now unknown. In 1802, he came to public notice with his Treatise on Astronomy; the Royal Military Academy in Woolwich snapped him up as second mathematical master. There, he continued to publish copiously and in 1823 determined the velocity of sound. He was also an honorary member of the Institute of Civil Engineers. When Gregory came to Deptford then, he was an eminent man as well as one actively involved in education. His commitment to institutions such as the one he proposed here is illustrated by the fact that his last lecture before his death would be at the Woolwich Institution. As a Dissenter, he was also involved in the proposals for London University. The meeting must have been a success: Deptford got its Mechanics' Institution, established 'for the promotion of useful knowledge among all persons, but more especially the working classes'. 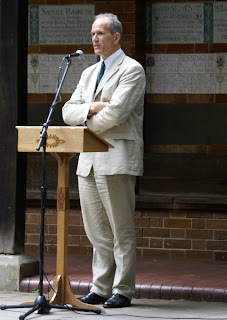 Gregory returned to give the lecture which marked its first anniversary. Once again, he spoke of humble men who had gone on to make great contributions to scientific knowledge. Among his examples was that of a coal miner with whom he corresponded on higher mathematics. With such an emphasis on self-improvement, it is unsurprising that this lecture was cited approvingly by none other than Samuel Smiles, famed as the author of Self Help. 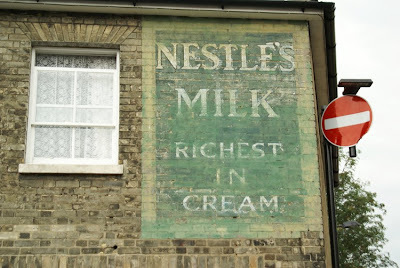 This Nestlé sign in Bury St Edmunds is a close relative, albeit one in rather better shape, to the advert on New Cross Road (left). Both proudly declare that the milk is 'richest in cream'. I nearly missed this one, as I was walking the opposite way down the street. 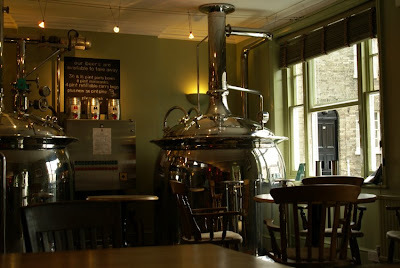 However, I stopped for a beer in the Old Cannon, which brews its own right in the bar (and it's rather nice). As I looked out of the window, there the sign was - and I'm sure there's a moral in that story! This road may not be one of the best-known in Borough, but Ayres Street is more interesting than it first appears. 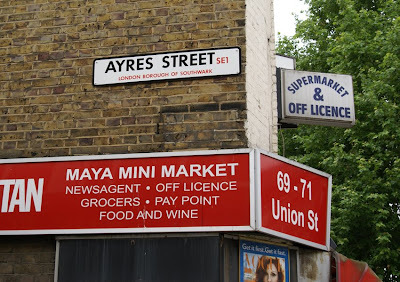 The name should be familiar to regular readers: it was changed from Whitecross Street in tribute to Alice Ayres, who is also immortalised in Postman's Park. Much of the streetscape would be unfamiliar to her today. Even the very Victorian White Cross Cottages postdate her death. 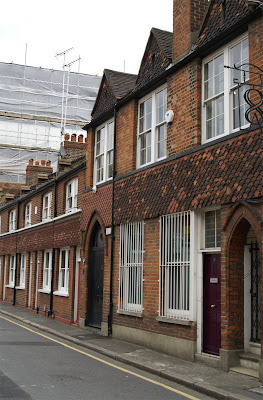 They were built in 1890 by social reformer Octavia Hill, to designs by Elijah Hoole, as model social housing. Hill was a reformer who campaigned for quality homes and open spaces for the poor. Her most famous achievement was the founding of the National Trust, but housing work was the primary theme of her working life. She began in 1864, leasing three slum properties in Marylebone, and had a portfolio of thousands of homes by the time of her death. They were managed by a network of female volunteers (and later paid workers) who operated her system of weekly visits to collect the rent. Those visits allowed the women to check the state of the property as well as perform something of a social work role in getting to know the family and help with issues such as finding employment. Further, they ensured regular payment: vital as Hill operated on the 5% principle (investment in such philanthropic ventures should provide a 5% return on capital). Surplus rental income was put into projects including classes and children's playgrounds; tenants were closely involved in those decisions. 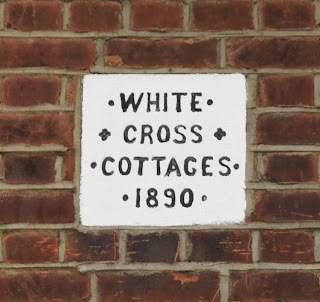 The housing scheme grew enormously, and gradually moved from refurbishing existing properties to building new ones as well - White Cross Cottages, along with nearby Red Cross Cottages, are perhaps the most notable survivors. Hill also took over the management of a large number of Church properties which had become slums, including some in Deptford. Hill saw quality of life as depending on more than housing and also worked to provide amenities such as community halls. Her campaign for open spaces not only led to the National Trust but also involved her in seeking rights of access to common land and the transformation of disused graveyards into public space. Among her successes was the saving of Parliament Hill Fields from development. She was also involved in the establishment of the Army Cadets. Most of Hill's principles were admirable: the emphasis upon the self-respect of tenants, small-scale, high-quality developments and tenant involvement. However, for all the radical nature of her housing work, Hill was conservative in other ways. She opposed state involvement in welfare provision, regretting the role of London County Council in providing social housing - thus failing to acknowledge that sometimes, concerted responses were needed to large-scale problems. She attached a great deal of importance to the domestic, seeing it as an appropriate role for women: although her female staff were increasingly paid employees, they were working at a local level in a domestic role. By contrast, she opposed women's involvement in national politics to which she believed they were ill-suited. Octavia Hill has left a lasting legacy in many areas: housing policy, the establishment of professional housing managers, social casework, provision of public open spaces, and the National Trust itself. That legacy also survives in concrete form in such unassuming places as this Borough side-street. 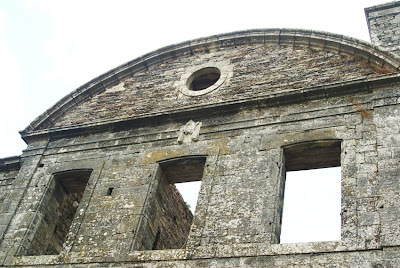 The Abbaye de Bon Repos, near Gouarec in Brittany, is a sturdy grey stone building. However, its stones - unremarkable at first glance - are in fact strangely appropriate to the locale. To discover why, a much closer look is needed. The grey stone is scattered with white lozenges, and in many of these are black crosses. 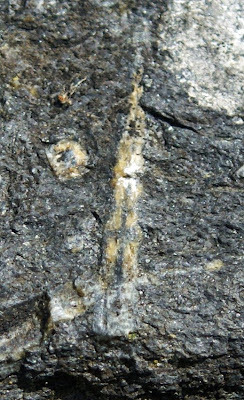 The little symbols are known in crystallography as macles, formed when the local schist was compressed by granite to create crystals of chiastolite. Many of the inclusions form lozenges-within-lozenges rather than the more distinctive crosses. However, where there is a piece of stone containing a cross, myth says that it has the power to bring happiness and ease heartache. 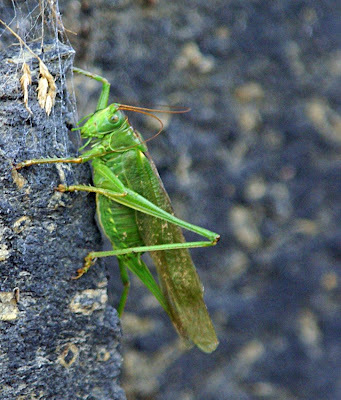 Perhaps this large grasshopper basking on the wall was more concerned with affairs of the heart than the heat of the sun? The Religious Tract Society was founded in 1799 to publish interdenominational Christian literature. It was a commercial success, and as a result was able to distribute large quantities of literature around the world. Among its publications were illustrated tracts suitable for Sunday School distribution, and I have one of these which I picked up a while ago. 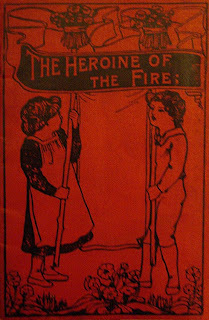 Back then, The Heroine of the Fire* simply seemed typical of such Victorian moral tales, but re-reading it now I'm struck by how closely it resembles the story of Alice Ayres (although the children saved by our heroine, Nelly, are rather more middle-class than Alice's charges). 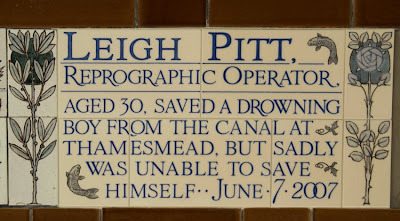 When Watts established the Postman's Park memorial, he wanted it to serve an instructive as well as commemorative purpose. However, he was suspicious of conventional religion; that lack of evangelism probably contributes to its enduring resonance and appeal. By contrast, the RTS added a particular Christian spin to its tales which jars with most modern readers. To modern sensibilities, the stories are a combination of the gruesome and the sentimental which we might prefer to spare our own children. However, it is perhaps not only religious sentiment which has changed, but also the harsh reality of child mortality. In a world where many children did die in fires and other accidents, or from diseases and poverty, maybe these tracts offered comfort. 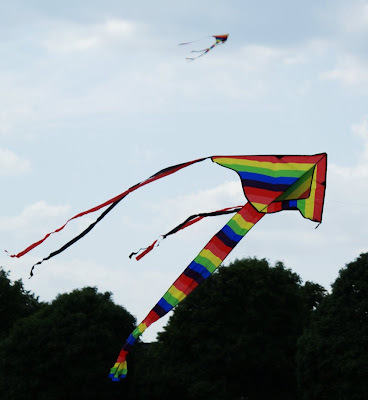 My childhood kite-flying experiences were mostly unrelentingly earth-bound disappointments. The curse is unbroken: when I wandered through Blackheath Kite Festival at the weekend, most kites seemed to be taking a rest. However, I did see a few colourful examples still flying high. 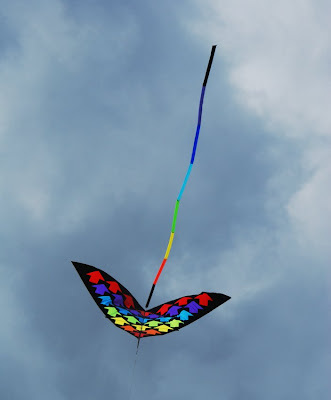 And while we're on the topic of kites, why not see if you can find the fault in a vintage kite-flying scene over on the Unmitigated England blog? On Friday, the London Fire Brigade Museum had a rare open day (IanVisits was also there and has more to say on the museum's very limited opening). After writing about George Lee and Joseph Andrew Ford, Victorian firemen who died in falls from their fire escape ladders, it was interesting - and sobering - to see some of these machines. These ladders could reach up to sixty feet, and the thought of climbing that high on such a contraption is enough to terrify me. It's easy to see, then, why chief officer Massey Shaw insisted on employing former sailors. The canvas chutes down which civilians could descend must have been pretty frightening, but presumably less so than climbing down the actual ladders. The model pictured on the left illustrates how they worked (click to enlarge). 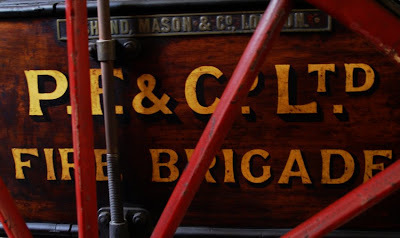 The museum also explains that private fire brigades persisted long after the London Fire Brigade took over from the insurance companies, and its exhibits include material from those private brigades. They were usually based in workplaces, particularly those which used hazardous materials. Rotherhithe biscuit manufacturers Peak Freen & Co had their own equipment including a wheeled fire escape. However, it is the public fire brigade to which the museum is mainly dedicated. It tells a fascinating story - one it would be nice to have more opportunities to explore there. 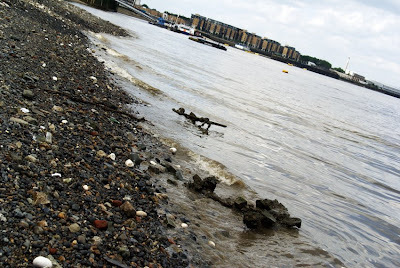 Yesterday, I saw Greenwich from a new angle - literally - with a guided walk along the Thames foreshore. In happy contrast to the muddier event at Custom House a few weeks ago, the 'beach' was silt-free! Henry VIII's palace, Placentia, has left its traces on the edges of the Thames - there are even water-worn pieces of Tudor brick. More humble inhabitants have also left clues to their lives including pieces of clay pipe, pottery and glass. 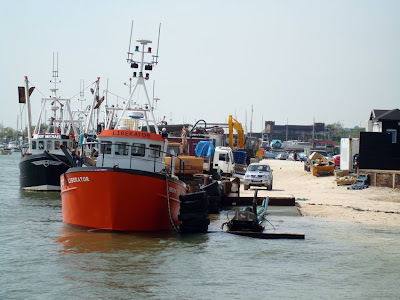 The area's industry, too, has altered the riverscape with barge beds, anchors, and 'rubbing posts' which protected moored ships and the river walls from overly-close contact as the boats moved with the tide. 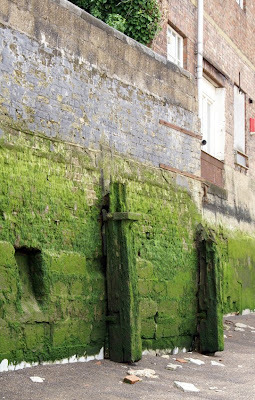 Structures such as the river walls tell us about the Thames itself, too. Walls are raised as high tide level rises, for example. They are also rebuilt from time to time: this particular stretch shows four different periods of building. The algae-free white strip at the bottom indicates recent erosion of the foreshore. However, I did remember to look outwards from time to time, and enjoy the views as far as Deptford. The walk was one of a numer of events organised by the Thames Discovery Programme. 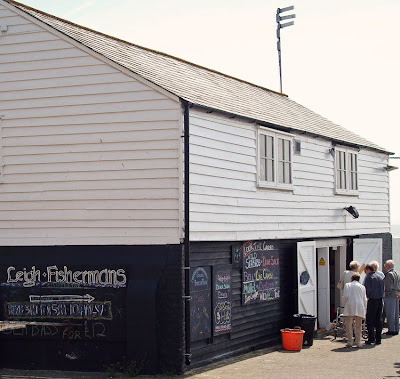 Find out about future activities, as well as the archaeology of the foreshore, on their website. Last week, the new Watts Memorial information panel was unveiled, but on Thursday something even more special was added to the memorial: the first new plaque for over seventy years. His colleagues, particularly Jane Michele, and his fiancée Hema Shah persuaded the Diocese of London to allow a plaque to be added to the Memorial. It was unveiled yesterday in the presence of the Lady Mayoress. The Diocese of London have indicated that they will consider other applications for plaques commemorating 'acts of remarkable heroism'. Let us hope that this marks a revival of Watts's vision, and that the Memorial will continue to be an evolving part of London life. 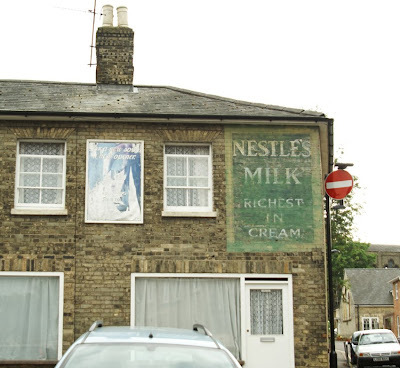 Frustratingly, two of my most local ghost signs are partially obscured. Any ideas on what these signs are advertising would be very much appreciated! 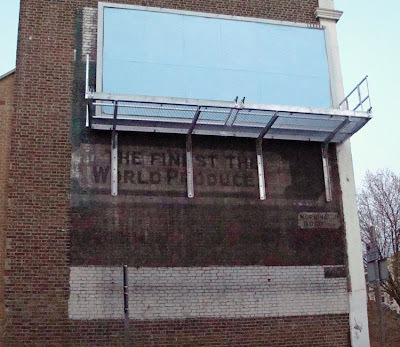 First, the slogan of this advert on Mornington Road is 'the finest the world produces' - but finest what? My best guess is that the first two letters at the top could be 'LI', which brings Lipton's to mind - but it really is no more than a guess. Second, on Deptford High Street, this sign clearly advertised TEA. Again, though, the brand name is missing. 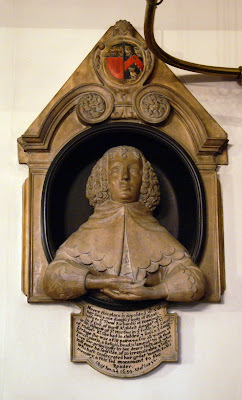 Elizabeth Richardson, wife of Sir Thomas, is not only depicted visually on her memorial but also given a brief biography. Eldest daughter of Sir William Hewytt of St Martins in the Fields, she was mother of ten children (7 sons, 3 daughters). 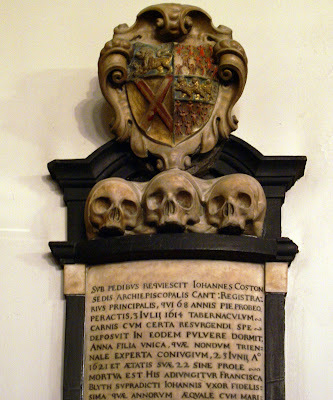 She died on 24 January 1639; her husband survived her and expressed his 'irreparable loss' in the monument. He described her character thus: 'she was a fitt patterne for all women of honor, pietie, & religion; Dead, is lamented by all that knew her". One son and one daughter were buried with her. 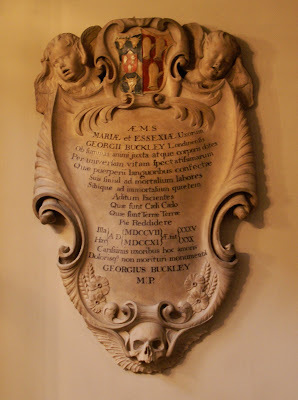 Although I've visited Postman's Park many times, the Celebration last Wednesday was my first opportunity to visit its neighbouring church, St Botolph Without Aldersgate. The saint has four churches in the London: the others are at Aldgate, Billingsgate and Bishopsgate. 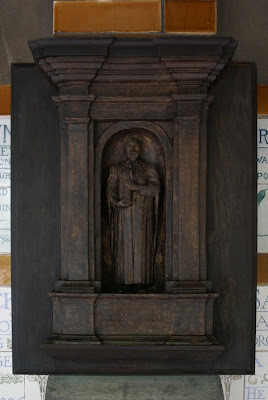 All were built at at around the same time by the major city gates, for Botolph was patron saint of travellers. This City church, like most, was rebuilt after the Great Fire of 1666, but its history stretches back to the eleventh century when a priory and hospital were here. 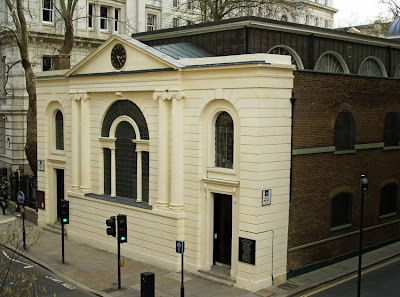 St Botolph's was rebuilt in 1788 by architect Nathaniel Wright. A classical facade was added in 1831, but the exterior remains essentially simple. By contrast, the interior is pretty stunning. 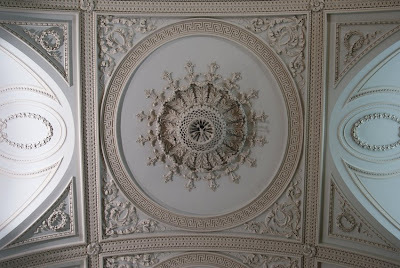 It was designed by Nathaniel Evans in 1788, although later fittings and furnishings have been added. The east end of the church includes an impressive window - not stained glass but a 'transparency' (a painting on glass). 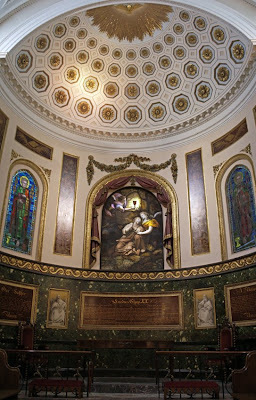 It is the only one of its kind in the city, painted by James Pearson in 1788. By contrast, the stained glass windows are all Victorian or later. 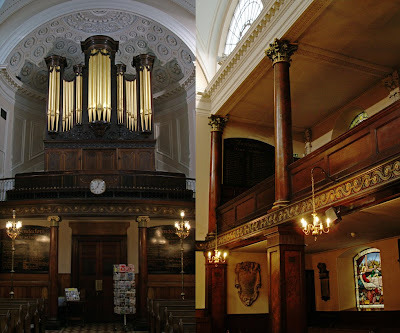 Another distinctive feature is the organ, also dating from the rebuilding and the only surviving Samuel Green organ in the City. 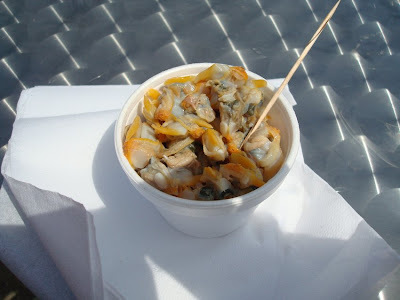 I'm not going to summarise Sunday's guided walk of Deptford - Andie has already done a brilliant job here. However, it did prompt me to photograph and post about the magnificent houses on Albury Street. Albury Street was originally Union Street, a name commemorating the union of England and Scotland in 1707. While the south side of the road has been rebuilt with modern homes, the north still has its terrace of wonderful eighteenth-century houses. 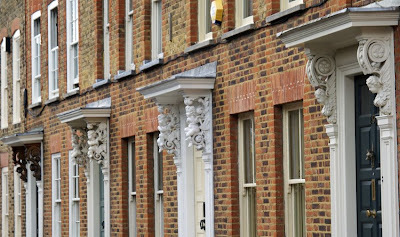 As a thriving dockyard town, Deptford needed homes for all classes and while labourers might live in wooden cottages, shipbuilders and naval officers wanted something more upmarket. Thus local bricklayer Thomas Lucas built the Union Street homes from 1706; he also built St Paul's Church on the High Street. Notable residents include John Gast (1772-1837), an early trade unionist, author of radical pamphlets and dissenting preacher. However, he lived not in one of these fine houses but in the King of Prussia public house. Legend has it that Lord Nelson and Lady Hamilton met in one of the homes, but there is no evidence to support this romantic tale. In the early twentieth century, nursery pioneers the McMillan sisters held a Boys' Night Camp at number 24. It provided poor children with the opportunity to wash and get clean nightclothes (the girls' camp was in Evelyn Street). 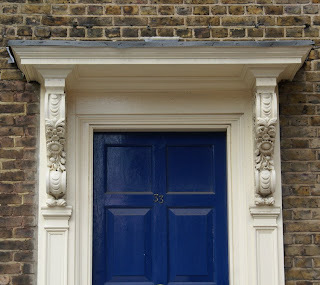 The most distinctive feature of these houses is their magnificent doorways. However, many of the splendid wooden canopies are replacements for originals which were rather mysteriously lost when taken into storage (for their protection!) by London County Council. Master carver Charlie Oldham did much of the restoration work. Now based in Frome, he had his first workshop in Deptford - very appropriately, since it was also the starting-place for Grinling Gibbons. 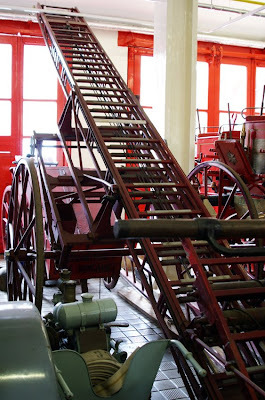 Friday is the London Fire Brigade Museum open day. If those bits of firefighting history we came across in the Postman's Park stories interested you, then do make the most of this chance to visit. Normally the museum is by appointment only, but on Friday 11am-3pm you're welcome to drop in at Winchester House, 94 Southwark Bridge Road (admission free). Saturday, let's hope for fine weather as it's the St Nicholas' Church Fete here in Deptford. From noon until 6pm there will be lots of attractions including drama, a coconut shy, music, dance and all sorts of food. 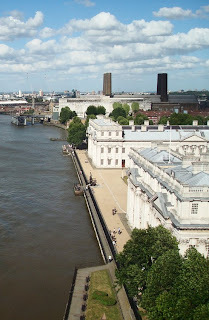 Sunday offers a Greenwich walk with a difference, organised by the Thames Discovery Programme. They aim to share knowledge about, and encourage involvement in, recording and understanding the archaeology of the Thames foreshore. 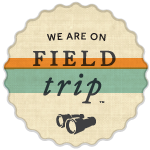 (I went on a previous walk - and went on to do part one of their volunteer training on Saturday, and it's fascinating.) Sunday's walk aims to see what survives of the old Tudor river stairs and other foreshore features before going back up the stairs to visit the Naval Hospital. It's free, but numbers are limited so you need to book: click here for details. 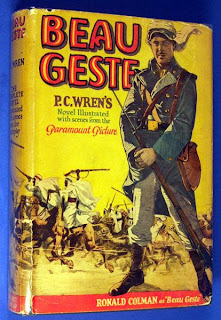 The famous novel Beau Geste was one of a series of romanticised accounts of the Foreign Legion produced by P C Wren (1875-1941). Originally just Percy Wren, son of a schoolmaster, he was born at 37 Warwick Street, Deptford. * However, he clearly wasn't proud of his origins: he misled others into believing in a more privileged birth in Devonshire, and while studying at Oxford he renamed himself 'Percival Christopher'. The middle name was presumably chosen to suggest a family connection to the famous architect. Wren's future life, like his books, extended far beyond Deptford. However, details are hard to pin down thanks to Wren's fondness for elaborating his personal history. We do know that he taught in India - his application to the Indian Educational Service had to give his real birth details - becoming a headteacher and educational inspector. Beau Geste was one of a number of novels and textbooks written by Wren, but is by far the most successful. Published in 1924, the first film of the book appeared in 1926. Although he was in active service during the First World War, Wren's claim that he joined the French Foreign Legion seems to have been another invention. The accurate detail for which the books are known was presumably the product of careful research. He is buried in Amberley, Gloucestershire. * Warwick Street ran between Payne Street and Douglas Way parallel to Adolphus Street, where Warwickshire Path now is. Further reading: Oxford Dictionary of National Biography (you can probably access this online via your library card: Lewisham library members can find their online resources here). Image from abebooks, which is also a great place to find your vintage copy! 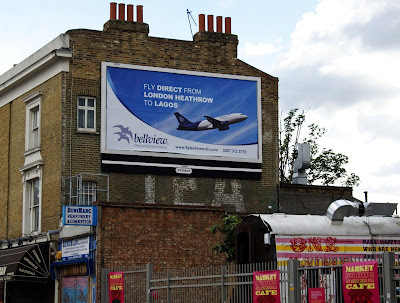 Do you live in Deptford, south-east London? Do you have a favourite haunt or pet hate? If so, please write, by next Friday, to lets.move@guardian.co.uk. 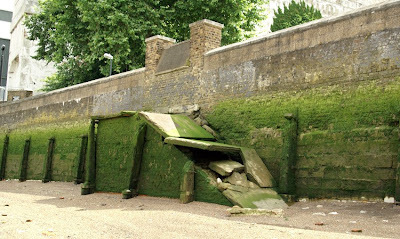 Thanks to Transpontine for the amazing story of an archaeological find in Greenwich. Witch bottles were buried to protect against spells. We know about them from 16th and 17th century literature and previous finds, but for the first time an intact bottle has been opened and its contents scientifically examined. The article doesn't reveal where the bottle was found. However, they tended to be placed at building entrance and exit points, including the hearth. This particular example had most of its solid contents in the neck, suggesting it had been placed upside-down. Further reading: the original New Scientist article; more on witch bottles; the Greenwich Phantom's account. Image from New Scientist - more pictures here. 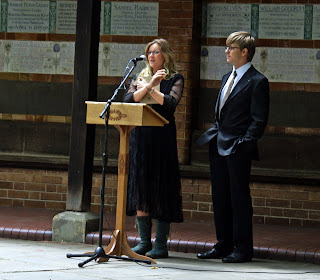 There may be no happy endings to the Watts Memorial stories, but yesterday's Celebration of Postman's Park was definitely upbeat. 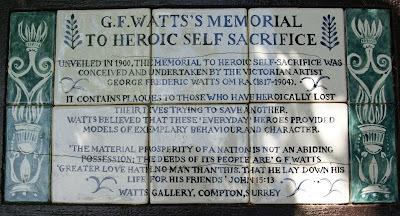 As I'd already reported, the memorial has been spruced up - and now Watts himself is back in place too! Alongside is a new plaque which explains the memorial. It complements the tiles inside perfectly, and will no doubt help a lot of confused passers-by to understand the site. Sandy Nairne, Director of the National Portrait Gallery, followed the unveiling with a talk on portraying heroism. Visitors were entertained throughout the afternoon with drama and song. Daniel Hit by a Train from Lone Twin Theatre Company has already toured the UK, but will be back in the Barbican next year. It features all 53 stories from the memorial, yet the extracts performed yesterday indicated that the play will make a much more entertaining, less depressing evening out than that might suggest. 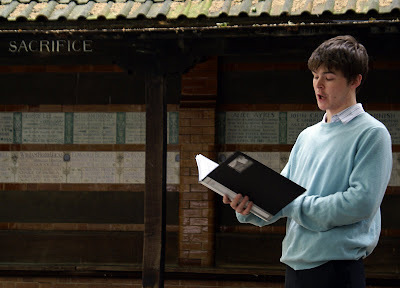 A very different dramatic event, also inspired by the memorial's stories, is the Actors' Temple production Postman's Park. 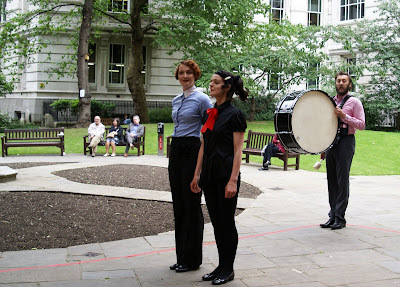 The lives of people commemmorated in the park are reimagined for a site-specific event in St Pancras Crypt, to take place 27 July - 2 August; excerpts from characters including Sarah Smith, Mrs Yarman and Ernest Benning were read. Baritone Alexander Knox struck a suitably Victorian note with his performance of Heroes of Everyday Life, a George Horncastle and Felix McGlennon song being performed for the first time in 100 years. All that and cream teas as well! London history in a day - literally!